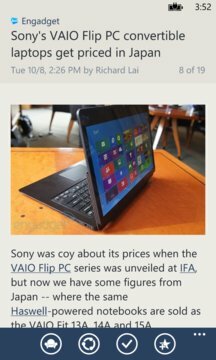 A fast, clean and powerful RSS news reader for Windows (universal app). Login/purchase once and run on multiple devices (Mobile, PC or Tablet). Feedly client. No ads in trial version. • Clean, modern design, inspired from Windows Phone. 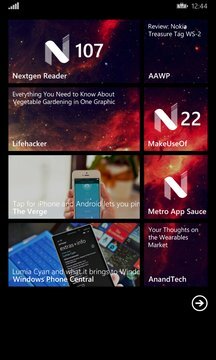 • Pin multiple live tiles to start and see headlines on start. • Offline support, image caching and a lot more. • Read full articles (powered by Readability). • Search, discover popular feeds, or browse through categories. • Share articles on Twitter, Facebook, LinkedIn, Tumblr, etc. • Save to OneNote, Pocket, Readability, Instapaper, etc. Customize or personalize design with tons of options. • Contact's access: Set favorite addresses for sharing articles quickly via email. • Photo's access: Save images from reading view to phone library.